On the last Sunday in January, 8 hardy souls braved the bone chilling weather to enjoy the winter wonderland in Swain. Fresh snow was still clinging to the branches of the hemlock and hardwood trees. The hikers divided into 2 even groups. All hikers started on the main trail, that primarily followed an old railroad bed. 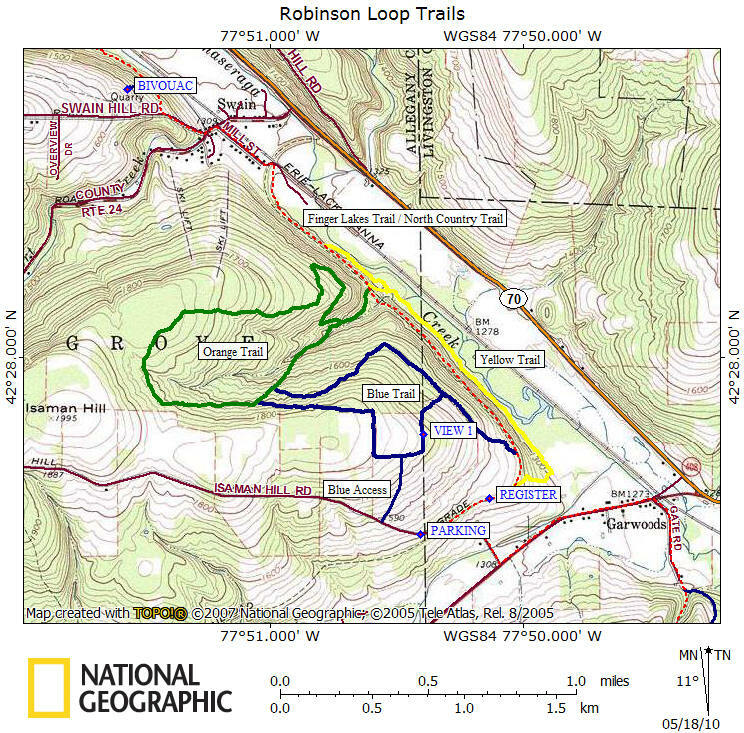 Then, the Rambo hikers, led by Duffy and Mark (in that order), scampered up the Robinson Loops, starting on the orange trail. During the climb up the central gully, the temperature continually rose resulting in the need to remove a layer of winter wear before the top. At the second junction of the blue, they switched over and cross the open fields at the top of the hill. Temperatures of course dropped quickly in the open wind. At the trail junction in the fields, the other climbers convinced Mark to check the map, avoiding a needless trip down the the wrong road and back. A few more slips and slides down a rutted logging trail and the hikers returned to the main Finger Lakes trail.. Returning to the lot by the main trail, they completed a vigorous 4-5 mile workout. The more leisurely hikers enjoyed a stroll down the mostly flat main trail (except for a fairly steep stream crossing) up the junction of the blue, and back, for a total close to 3 miles. After the hike, we got to warm up and enjoyed fellowship and fine fare in the back room of the Sierra Inn, reviewing this hike, and looking forward to some great future ones that Rick, and his hike leaders, have planned for us. Thanks to the Hill and Valley Riders and local landowners, we have permission to hike/snow shoe/cross country ski the C-4 Snowmobile and Feeder Trails in the East Springwater area, high above the hilltops that divide Livingston, Ontario and Steuben Counties. This scenic area offers views of the Cohocton Valley, windmills, and the unique secluded area and ponds of Wolf’s Gull and surrounding forests. distributing their raw milk to Land of Lakes. Naturalists and Cross Country Skiers will hike on Richards Road with a goal to reach the views at the top of Richards Road. They will return back down Richards Rd to the start point. or extended hike up and across the hill following the C-4 snowmobile trail to another pick up location on the lower part of Pardee Hollow Road. Tourists and Climbers will hike or snow shoe Richards Road to the top, and use C-4, S44 and the HVR-14 Feeder Trail to drop into Wolf Gull and exit on Garlinghouse at either the north or south end of the Gull. Cars will be placed at the exits for rides back to Schum Acres. Since we are hiking on the snowmobile trail, hikers need to be respectful and offer snowmobiles the right of way. Upon hearing an upcoming snowmobile, hikers will pass all to one side, and offer thanks. We wish to continue this relationship with Hill Valley Riders for pursuing our Springwater Trail development. We also have been invited in late June to rehike the Wolf Gull Area where Mr. Shipman claims the ponds are full of life and 5 ft. ferns. After hike social will be at the Mountain View Inn in Atlanta. Don’t worry you won’t miss the Super Bowl. Directions to Schum Acres on Garlinghouse Rd. From Springwater: go to Wayland and follow those directions. From Wayland: take Rt 21N for 5.6 miles. Turn left on Co Rd 38 (Garling House Rd AKA Rowe Rd). Park on the north (left) side about 1.1 miles from Rt 21. (about 0.3 miles past Pardee Hollow Rd). From Honeoye: take W Lake Rd south. Turn right onto French Hill Rd. At the tee (at Dug Rd) turn right to stay on French Hill Rd. Take the first left on Garlinghouse/Atlanta Rd. After 1.1 miles park on the right (north) side. Directions to Schum Acres and the South end of Wolf Gull on Garlinghouse Rd. Look for the Springwater Trails sign to coordinate parking. From Wayland: take Rt 21N for 5.6 miles. Turn left on Co Rd 38 (Garlinghouse Rd AKA Rowe Rd). Wolf Gull is on the north (left) side about 1.1 miles from Rt 21. (about 0.3 miles past Pardee Hollow Rd). From Honeoye: take W Lake Rd south. Turn right onto French Hill Rd. At the tee (at Dug Rd) turn right to stay on French Hill Rd. Take the first left on Garlinghouse/Atlanta Rd. After 1.1 miles Wolf Gull is on the right (north) side. Directions to the Richards Rd intersection with Pardee Hollow Rd. From Springwater: go North of 15A for .8mi from the light. Turn right on Wheaton Hill Rd (see the maple sign). At the tee, at the top of the hill, turn right onto Wetmore Rd. Bear right on Tabors Corner Rd. After 1.8 miles, turn left on Pardee Hollow Rd . Turn right at the tee to stay on Pardee Hollow Rd. Continue south for 1.9 miles. Park on the west (right) side of Pardee Hollow Rd near Richards Rd (the second left off of Pardee Hollow. From Wayland: take Rt 21N for 5.6 miles. Turn left on Co Rd 38 (Garling House Rd AKA Rowe Rd). Take the first left onto Pardee Hollow Rd and continue for 1.9 miles. Park on the west side (left) of Pardee Hollow Rd near Richards Rd. From Honeoye: take W Lake Rd south. Turn right onto French Hill Rd. At the tee (at Dug Rd) turn right to stay on French Hill Rd. Take the first left on Garlinghouse/Atlanta Rd. Go Right on Pardee Hollow Rd and continue for 1.9 miles. Park on the west side (left) of Pardee Hollow Rd near Richards Rd.